There is only limited information on the epidemiology and outcomes of acute kidney injury (AKI) in critically ill patients from low- and middle-income countries. This study aims to identify the etiology, short-term outcomes, and determinants of mortality in patients with AKI admitted to multiple medical and surgical Intensive Care Units (ICU's) in a tertiary care center. The study also aims to compare the clinical characteristics and outcomes of community-acquired AKI (CAAKI) and hospital-acquired AKI (HAAKI). A prospective, observational study was done from June 2013 to October 2015. All patients over 18 years with AKI admitted in various medical and surgical ICU's seeking nephrology referral were included. AKI was defined according to KDIGO criteria. The follow-up period was 30 days. A total of 236 patients were recruited from five medical and nine surgical ICU's. Majority (73.3%) were males. About 53.38% patients had CAAKI, whereas 46.61% had HAAKI. The predominant etiologies for AKI were sepsis (22.4%), trauma due to road traffic accidents (21.18%), acute abdomen (perforation, acute pancreatitis, bowel gangrene, intestinal obstruction and cholangitis) (18.64%), and cardiac diseases (10.59%). Sepsis and acute abdomen were the most common causes of CAAKI, whereas trauma and cardiac causes were the predominant causes of HAAKI (P < 0.05). Patients with HAAKI were younger, admitted in surgical units, had lower SOFA scores, lower serum creatinine, lesser need for dialysis, longer hospital stay, and earlier stages of AKI compared to patients with CAAKI (P < 0.05). The 30-day mortality was 52.54%. The mortality was not different between CAAKI and HAAKI (56.3% vs. 48.18%; relative risk = 0.86: 95% confidence interval 0.67–1.1). The mortality was similar across different stages of AKI. Acute kidney injury (AKI) is a major public health concern, associated with high mortality, morbidity, and long-term risk of chronic kidney disease. Significant differences exist in the epidemiology and outcomes of AKI from the developed and developing world. More than 85% of the global burden of AKI is from developing countries. AKI can be community-acquired AKI (CAAKI) or hospital-acquired AKI (HAAKI). AKI in developed countries tends to affect elderly patients with comorbidities, and result in higher mortality rates. The proportion of patients with HAAKI tends to be higher compared to the developing world. On the other hand, AKI in tropical, low and middle-income countries like India is characterized by a higher burden of CAAKI, occurring in relatively young patients without significant comorbidities., The proportion of CAAKI is more and most often a single reversible factor such as infection, toxin, volume depletion, or drugs might be responsible. The mortality rates are often lower compared to AKI from developed countries. AKI is common in critical care units and is a major factor contributing to adverse outcomes. The reported mortality rates often exceed 50%., As there is no nationwide AKI registry, significant lacunae exist in the knowledge of AKI in Indian ICU. The existing Indian data on AKI in critically ill patients are derived from multiple single-center studies.,,,,,,, Considering the geographical and socioeconomic diversity of the country, regional differences are expected in the epidemiology and outcomes of AKI. 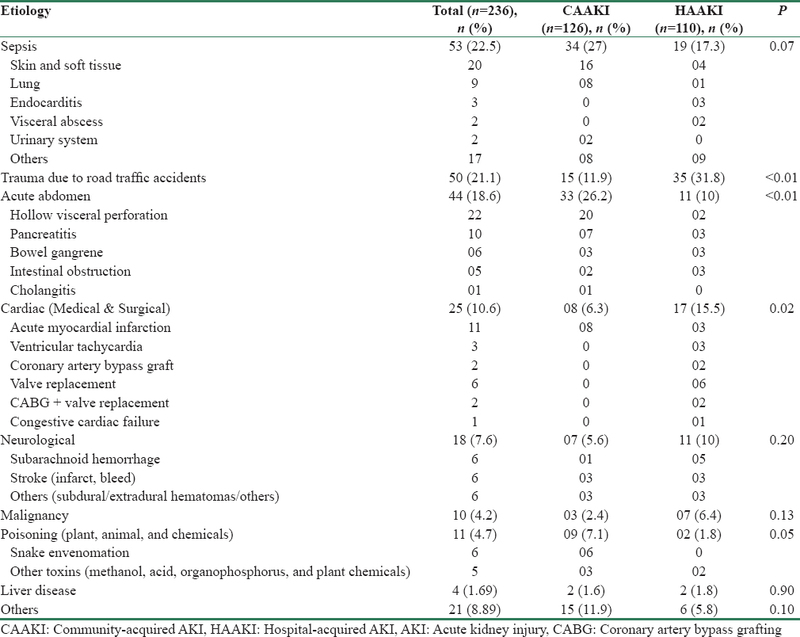 Existing literature from India reports CAAKI as the leading cause of AKI in critically ill. Multiple factors such as inclusion of patients from single discipline ICU's and retrospective designs often limit generalization of results. HAAKI is often under recognized and under reported in the developing world. There are no comparative studies on the epidemiology and outcomes of HAAKI and CAAKI in critically ill patients from India. Significant heterogeneity exists in the case definitions of AKI in critically ill patients. Some of the Indian studies had used creatinine-based criteria, whereas a few recent studies have used RIFLE criteria.,, The existing classification schema for AKI have been replaced by KDIGO clinical practice guidelines (2012) which incorporates the better elements of both RIFLE and AKIN criteria. To the best of our understanding, this is the first study from India in a mixed population of patients from multiple medical and surgical ICUs, using KDIGO criteria for the diagnosis of AKI. This study aims to identify the etiology, short-term outcomes, and determinants of mortality in patients with AKI admitted in ICU's in a tertiary care center. Further, the study intends to compare the clinical characteristics and outcomes of CAAKI and HAAKI in critically ill.
A prospective study was done from June 2013 to October 2015 in a 2000 bed strength tertiary care hospital, located in South India. The study protocol was approved by the Institute Ethics Committee. All adult patients with AKI admitted in various medical and surgical ICU's seeking nephrology referral were included. Those with previously documented chronic kidney disease (glomerular filtration rate [GFR] <60 ml/1.73 m2, proteinuria, and abnormal renal imaging), solid organ transplant recipients, obstetric AKI, and history of receiving renal replacement therapy before admission to ICU and readmissions to ICU were excluded from the study. Informed consent was obtained from legally accepted relatives of all participants. KDIGO criterion was used for defining AKI. For patients without a baseline estimated GFR (eGFR) before the present illness, an absolute rise of creatinine by 0.3 mg/dl after onset of the current illness was required for inclusion. AKI at the time of admission or within 48 h of admission was considered as CAAKI. AKI developing after 48 h of hospitalization was considered as HAAKI. All patients were followed for 30 days from enrolment. Complete recovery (CR) was defined as urine output of >1 ml/kg/h with serum creatinine <1.4 mg/dl. Partial recovery (PR) was defined as fall in serum creatinine by ≥50%, urine output ≥0.5 ml/kg/h with dialysis independence for patients who were started on dialysis. All categorical variables were expressed as frequencies and percentages, and continuous variables were expressed as mean with standard deviation or median with range. Chi-square test, Student's t-test, and Mann–Whitney U-test were used to compare the groups. Mortality between groups was expressed as relative risk (RR) with confidence intervals (CI). The data were analyzed using SPSS version 19 (IBM Corporation; Armonk, NY, USA). Patients were recruited from five medical and nine surgical ICUs. Two units admitted general medical and surgical patients; rest were subspecialty units. All except one were open ICU's. A total number of 236 patients were recruited for the study. This constituted 1.45% of ICU admissions (n = 16794). Serum creatinine-based criterion was used for diagnosing AKI in 232 patients. All patients received crystalloids for initial fluid resuscitation. Seven patients received isotonic albumin. About 53 patients received blood and blood products at the time of enrollment. About 68 (28.81%) patients received diuretics. Around 15 patients received >1 nephrotoxic agent. Mannitol was given for 42 patients (17.79%). About 46 (19.49%) patients received other nephrotoxic medications before enrollment. This included aminoglycosides (n = 26; 11.01%), nonsteroidal anti-inflammatory drugs (NSAID's) (n = 20; 08.47%), and vancomycin (n = 2; 0.08%). The median duration of onset of HAAKI was 72 h post admission (range 48 h–30 days). Comorbidities were present in 98 (41.52%). Diabetes was the most common comorbidity (n = 49; 20.76%) followed by hypertension (n = 39; 16.52%). The clinical and biochemical characteristics of the study population are given in [Table 1]. The predominant primary etiologies responsible for hospitalization are given in [Table 2]. Majority of patients had multiple organ involvement at the time of enrolment. About 60.59% had lung injury requiring mechanical ventilation, 53.38% were on inotropes, 67.37% had abnormal liver function tests, and 25% had low platelet counts. The etiological risk factors leading to AKI are listed in [Table 3]. Among the 126 patients who received vasopressors, 73 patients were on noradrenaline, 34 received noradrenaline + dopamine, 9 received dopamine alone, 4 received noradrenaline + dobutamine, and 6 received dobutamine alone. Of the 38 patients (16.1%) who developed infections during hospital stay, 17 patients had intra abdominal infections, 5 had ventilator-associated pneumonia, and rest had vascular and urinary catheter infections. In the initial 48 h, 12 patients (5.08%) recovered from AKI. Of 126 patients with CAAKI, 26.98% (n = 34) showed complete recovery (CR) at the end of the 30 days, whereas 16.67% (n = 21) showed partial recovery (PR). Among 110 patients with HAAKI, 32.73% (n = 36) had CR and 18.18% (n = 20) had PR. One patient continued to remain dialysis-dependent at the end of the 1st month. The clinical and biochemical characteristics of survivors and nonsurvivors are given in [Table 4]. Age, vasopressor use, and alkaline phosphatase levels were higher among nonsurvivors. The non-survivors had lower platelet counts. The 30-day mortality of the cohort was 52.54% (n = 124). Among these, about 20.3% deaths (n = 48) occurred in the initial 48 h. Fifty one (21.61%) patients expired between 48 h and 1 week, 24 patients (10.17%) expired in the 2nd week, and 1 patient passed away in the 3rd week. The mortality was not different between CAAKI and HAAKI ([71/126], 56.3%) versus ([53/110], 48.18%); RR = 0.94 (CI 0.74–1.19). Mortality was comparable between patients in medical (54/103; 52.4%) and surgical ICU's (70/133; 52.63%). Compared to AKI 1, the RRs of death for AKI 2 and AKI 3 were 0.96 (CI 0.66–1.40) and 1.02 (CI 0.72–1.44), respectively. 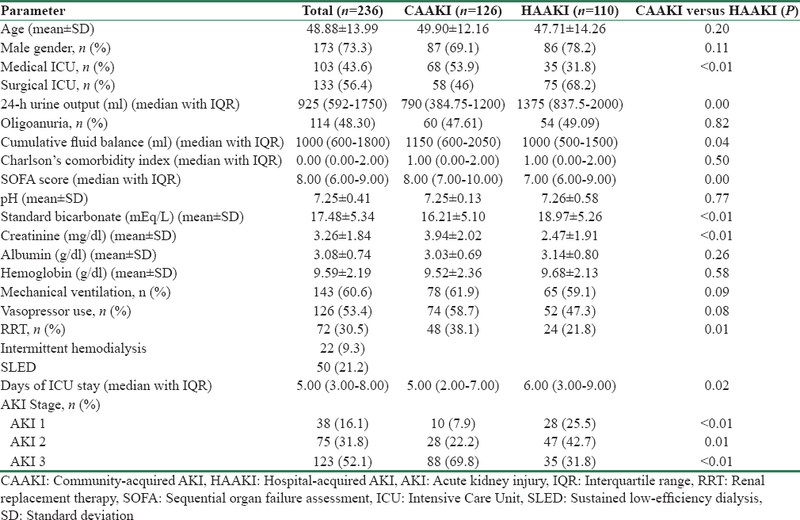 When stratified for the stage of AKI, the mortality was similar with CAAKI and HAAKI [Table 5]. The epidemiology and outcomes of AKI show significant variations across different parts of the world. Compared to data from high-income countries of Europe and America, the current study had younger patients with few comorbidities.,,, Most of the Indian studies had reported the mean age of patients varying from 40 to 60 years.,,,,, Sural et al. reported a considerably lower age of 28.6 years, in a cohort of predominantly elective postsurgical patients. In the current study, sepsis was the most important cause of AKI, accounting for 22% of admissions. Sepsis tends to be the predominant etiology of AKI in ICU's across the globe., It is reported that sepsis accounts for 31% to 86% of AKI in Indian ICU's.,,,,,,, These variations might be secondary to regional differences in epidemiology, inclusion of single discipline versus multidiscipline ICU's, and variations in referral patterns as well as admission policies to ICU'S. AKI in rural areas is often characterized by the predominance of a preventable single medical condition or infection in an otherwise healthy individual., A major proportion of patients with a diagnosis of sepsis in the current study had an identifiable focus of infection such as skin and soft tissues. This is in contrast to previous studies from India, which reported lung and abdomen as predominant foci of sepsis-related AKI., The hot and humid tropical environment and poor living conditions might be acting as a predisposing factor for skin infections. Early detection and treatment of skin diseases at community level could have potentially prevented the progression to sepsis. Other preventable etiologies included poisonings, envenomation, trauma, and tropical infections such as dengue and leptospirosis. An etiological comparison between studies from different parts of India is often difficult due to significant regional differences in disease spectrum. In general, AKI is considered to be common in patients from medical units. However, we observed that surgical patients outnumbered medical patients in the current study. This might be secondary to the regional reference practices and policies. Almost one-fifth of the patients in the study were trauma victims, as our institution is the only tertiary level trauma center in the adjoining areas. Furthermore, the bed strength and patient turnover in surgical intensive units were almost double, compared to medical ICU's. The current study had nearly equal proportions of CAAKI and HAAKI. Eswarappa et al. reported that three-fourth of AKI in the ICU was acquired from community. Other studies from India had not attempted to classify AKI into hospital and community acquired. We observed that CAAKI was common in medical units, whereas a higher proportion of patients in surgical units had HAAKI. Surgical patients are considered to have a lower risk for AKI except in specific scenarios such as cardiovascular surgeries, burns, and trauma.,,, In the current study, a major proportion of surgical patients had emergency conditions such as acute abdomen and trauma, which puts the patient at higher risk for AKI. The prevalence of AKI is reported to be as high as 25% in trauma patients, predisposing to high morbidity and mortality., Multiple factors including radiocontrast, multiple transfusions, hyperosmotic agents, NSAID's, and other nephrotoxic medications often play a contributory role in these patients. Simple preventive measures such as adequate volume resuscitation and avoidance of nephrotoxic medications would significantly lower the chances of developing AKI in these high-risk individuals. More than half of the study population had advanced stages of AKI at the time of recruitment. Only 7% patients with CAAKI had stage 1 AKI. Even among patients with HAAKI, only 25% of patients had stage 1 AKI, implying in-hospital delays in recognition and referral. Delayed nephrology referrals resulting from lack of accessibility to health care is common in low and middle-income countries. Delayed recognition of AKI, as well as nephrology referral, frequently occurs in hospital settings as well; the reported referral rates can be as low as 15% from non nephrology departments. Around one-third of patients in the current study required renal replacement therapy, which was provided as sustained low-efficiency daily dialysis and intermittent hemodialysis. Due to high operational costs, continuous renal replacement therapies are often not feasible in the developing world. A few Indian studies have reported similar dialysis needs., A few other studies have reported considerably lower need for RRT., On the other hand, some authors have reported dialysis rates exceeding 75%., We could not proceed with dialysis for a few patients due to rapid deterioration of hemodynamic status in the initial few hours following admission. Our mortality rates were comparable with a previous study from India. Most of the investigators from India reported mortality rates exceeding 50% in different ICU settings.,, The demographic charecterstics of ICU patients tend to influence the outcomes. Mortality rates as high as 90% and as low as 7.8% have also been reported from different parts of India., A study from Iran reported mortality around 72%. A multinational study using KDIGO criteria for the diagnosis of AKI reported mortality rates around 18%. Cruz et al. reported a mortality rate of 36.3% in a multicentric study in mixed population where prerenal AKI was the predominant etiology of AKI. Sileanu et al. reported an in-hospital mortality of 18.1% in a mixed population of high-risk patients having cardiac or respiratory involvement. Compared to the current study, the mean creatinine values and extent of organ dysfunction were considerably lower in these studies.,, Apart from the severity of renal failure, other factors such as the underlying primary disease, delayed hospitalization, number and extent of vital organ systems affected, often play a detrimental role in the outcomes.,,, In the current study, more than three-fourth of patients had advanced AKI, more than half were requiring circulatory and respiratory support and the organ dysfunctions scores were fairly high, which might explain the higher mortality. Maximum deaths happened in the initial 48 h of hospitalization reflecting the poor general condition of the patients at admission. The heterogeneity in the etiology of AKI, retrospective study designs, selection bias, lack of uniform case definitions, and variability in the extent of organ dysfunction are major factors limiting comparison with previous studies from the region. The mortality in AKI tends to increase with higher grades of AKI.,, Surprisingly, we observed that mortality was comparable between various stages of AKI. We feel that a higher number of trauma patients might be responsible for this finding. Most of the trauma patients had AKI 1 and 2. Among 20 nonsurvivors with AKI stage 1, about 14 were suffering from trauma and stroke. The severity of underlying diagnosis, rather than AKI severity, might have been responsible for mortality in these patients. A type II error also might be present, as the patients with AKI 1 and 2 were considerably lower in the current study. The mortality of CAAKI and HAAKI were comparable in the current study. In general, CAAKI is considered to have a lower mortality than HAAKI. However, it should be recalled that the data is from general patients, not from critically ill. There is only limited comparative data on the outcomes of CAAKI and HAAKI in the critically ill. A study from China reported higher need for intensive care, dialysis, and mortality in patients with HAAKI. Wonnacott et al. also reported inferior survival with HAAKI. In both these studies, ICU patients accounted for <10% of the study population. It is not known whether the diagnostic criteria for AKI have any bearing on outcomes. A Brazilian study employing RIFLE criteria reported higher mortality among patients with CAAKI compared to patients who acquire AKI in the ward. A recent study employing KDIGO criteria reported comparable mortality between CAAKI and HAAKI. There is no published literature on the outcomes of CAAKI and HAAKI exclusively in ICU patients, who were diagnosed using KDIGO criteria. Whether mortality in CAAKI and HAAKI in ICU follows the same pattern as in general patients is not known. In general, patients with HAAKI are older and tend to be more sick compared to those with CAAKI. In the current study, we observed that patients with HAAKI were younger with lower SOFA scores and had less severe AKI, but this did not translate to better survival. This probably might be secondary to the large number of patients with trauma who were younger and death resulted from the severe nature of brain injury, rather than complications of AKI. The long-term mortality and GFR decline following HAAKI is reported to be comparable with CAAKI. It might be possible that etiologic and demographic parameters also might influence the outcomes of HAAKI and CAAKI. A higher cumulative fluid balance is an independent risk factor for mortality in AKI. In the current study, the cumulative fluid balance was comparable among survivors and nonsurvivors. A positive balance exceeding 10% of total body weight or absolute gain of 5.9 liters is proposed as the defining limit for increased mortality in patients with AKI., In the current study, the cumulative balance was much lower, with a median of 1 L, which might not have been sufficient enough to enhance the mortality risk. The current study had a fair representation of patients across multiple medical and surgical disciplines except obstetrics. To avoid inadvertent recruitment of patients with underlying CKD, urine output criterion was used only in patients a documented baseline normal eGFR before the onset of current illness. In India, especially in rural settings, majority of the population does not have access to basic renal function testing such as serum creatinine-based eGFR or urine protein analysis by dipsticks. As only four patients in the current study had a documented normal eGFR, we ended up using creatinine-based criteria in the remaining patients. It is established that the incidence and staging of AKI might change when serum creatinine criteria is used in isolation for diagnosing AKI. As per KDIGO definition, AKI diagnosis can be made if oliguria persists for 6 h, whereas a minimum period of 48 h is needed to make a diagnosis based on changes in creatinine. The detection rates of AKI with urine output criterion is almost double compared to creatinine-based criterion used in isolation. It is possible that we might have excluded some patients, especially with earlier stages of AKI, who would satisfy the urine output criteria. This probably might partially explain the similar mortality rates observed across different stages of AKI. Furthermore, the study is underpowered to detect differences in mortality between different stages of AKI. The mortality tends to remain considerably higher in critically patients with AKI, even after recovery. Serum creatinine levels did not return to baseline in 17% of patients, even at the end of 30 days. These patients represent various stages of acute kidney disease and need further follow-up for potential recovery or progression to CKD. Even in patients with recovery of renal function, mortality tends to remain higher for a considerable period. Longer follow-up would be required to identify adverse events like mortality. The epidemiology of AKI in the current study appears to be different from other studies from India. The clinical and epidemiological characteristics of HAAKI and CAAKI also vary considerably. HAAKI is common in surgical ICUs, whereas CAAKI is common in medical ICU's. Sepsis and acute abdominal emergencies are the most frequent causes of CAAKI, whereas trauma and cardiac causes are common causes of CAAKI. A major proportion of AKI in ICU in the current study had preventable etiologies. The mortality rates were similar between HAAKI and CAAKI. The underlying vital organ dysfunction appears to be a major predictor of death. More multicentric studies are required to delineate the region-specific differences in AKI. Understanding the regional differences in the disease patterns is imperative in formulating policies addressing the local needs. Ponce D, Balbi A. Acute kidney injury: Risk factors and management challenges in developing countries. Int J Nephrol Renovasc Dis 2016;9:193-200. Cerdá J, Bagga A, Kher V, Chakravarthi RM. The contrasting characteristics of acute kidney injury in developed and developing countries. Nat Clin Pract Nephrol 2008;4:138-53. Case J, Khan S, Khalid R, Khan A. Epidemiology of acute kidney injury in the Intensive Care Unit. Crit Care Res Pract 2013;2013:479730. Gurjar M, Baronia AK, Azim A, Prasad N, Jain S, Singh RK, et al. Septic acute kidney injury in critically ill Indian patients. Indian J Crit Care Med 2013;17:49-52. Mahajan S, Tiwari S, Bharani R, Bhowmik D, Ravi S, Agarwal SK, et al. Spectrum of acute renal failure and factors predicting its outcome in an Intensive Care Unit in India. Ren Fail 2006;28:119-24. Sural S, Sharma RK, Singhal MK, Kher V, Gupta A, Arora P, et al. Acute renal failure in an Intensive Care Unit in India – Prognostic factors and outcome. J Nephrol 1999;12:390-4. Eswarappa M, Gireesh MS, Ravi V, Kumar D, Dev G. Spectrum of acute kidney injury in critically ill patients: A single center study from South India. Indian J Nephrol 2014;24:280-5. Avasthi G, Sandhu JS, Mohindra K. Acute renal failure in medical and surgical Intensive Care Units – A one year prospective study. Ren Fail 2003;25:105-13. Singh TB, Rathore SS, Choudhury TA, Shukla VK, Singh DK, Prakash J, et al. Hospital-acquired acute kidney injury in medical, surgical, and Intensive Care Unit: A comparative study. Indian J Nephrol 2013;23:24-9. Prakash J, Murthy AS, Vohra R, Rajak M, Mathur SK. Acute renal failure in the Intensive Care Unit. J Assoc Physicians India 2006;54:784-8. Kher V, Srisawat N, Noiri E, Gharbi MB, Shetty MS, Yang L, et al. Prevention and Therapy of Acute Kidney Injury in the Developing World. Kidney International Reports; 26, 2017. Liaño F, Felipe C, Tenorio MT, Rivera M, Abraira V. et al. Long-term outcome of acute tubular necrosis: A contribution to its natural history. Kidney Int. 2007;71(7):679-86. Piccinni P, Cruz DN, Gramaticopolo S, Garzotto F, Dal Santo M, Aneloni G, et al. Prospective multicenter study on epidemiology of acute kidney injury in the ICU: A critical care nephrology Italian collaborative effort (NEFROINT). Minerva Anestesiol 2011;77:1072-83. Bouchard J, Mehta RL. Acute kidney injury in western countries. Kidney Dis (Basel) 2016;2:103-10. Hoste EA, Bagshaw SM, Bellomo R, Cely CM, Colman R, Cruz DN, et al. Epidemiology of acute kidney injury in critically ill patients: The multinational AKI-EPI study. Intensive Care Med 2015;41:1411-23. Eriksson M, Brattström O, Mårtensson J, Larsson E, Oldner A. Acute kidney injury following severe trauma: Risk factors and long-term outcome. J Trauma Acute Care Surg 2015;79:407-12. Podoll AS, Kozar R, Holcomb JB, Finkel KW. Incidence and outcome of early acute kidney injury in critically-ill trauma patients. PLoS One 2013;8:e77376. Daher EF, Silva Junior GB, Santos SQ, R Bezerra CC, Diniz EJ, Lima RS, et al. Differences in community, hospital and Intensive Care Unit-acquired acute kidney injury: Observational study in a nephrology service of a developing country. Clin Nephrol 2012;78:449-55. Samimagham HR, Kheirkhah S, Haghighi A, Najmi Z. Acute kidney injury in Intensive Care Unit: Incidence, risk factors and mortality rate. Saudi J Kidney Dis Transpl 2011;22:464-70. Cruz DN, Bolgan I, Perazella MA, Bonello M, de Cal M, Corradi V, et al. North east Italian prospective hospital renal outcome survey on acute kidney injury (NEiPHROS-AKI): Targeting the problem with the RIFLE criteria. Clin J Am Soc Nephrol 2007;2:418-25. Sileanu FE, Murugan R, Lucko N, Clermont G, Kane-Gill SL, Handler SM, et al. AKI in low-risk versus high-risk patients in intensive care. Clin J Am Soc Nephrol 2015;10:187-96. Xu X, Nie S, Liu Z, Chen C, Xu G, Zha Y, et al. Epidemiology and clinical correlates of AKI in Chinese hospitalized adults. Clin J Am Soc Nephrol 2015;10:1510-8. Wonnacott A, Meran S, Amphlett B, Talabani B, Phillips A. Epidemiology and outcomes in community-acquired versus hospital-acquired AKI. Clin J Am Soc Nephrol 2014;9:1007-14. Sawhney S, Fluck N, Fraser SD, Marks A, Prescott GJ, Roderick PJ, et al. KDIGO based acute kidney injury criteria operate differeny in hospitals and the community-findings from a large population cohort. Nephrol Dial Transplant 2016;31:922-9. Der Mesropian PJ, Kalamaras JS, Eisele G, Phelps KR, Asif A, Mathew RO, et al. Long-term outcomes of community-acquired versus hospital-acquired acute kidney injury: A retrospective analysis. Clin Nephrol 2014;81:174-84. Neyra JA, Li X, Canepa-Escaro F, Adams-Huet B, Toto RD, Yee J, et al. Cumulative fluid balance and mortality in septic patients with or without acute kidney injury and chronic kidney disease. Crit Care Med 2016;44:1891-900. Bouchard J, Soroko SB, Chertow GM, Himmelfarb J, Ikizler TA, Paganini EP, et al. Fluid accumulation, survival and recovery of kidney function in critically ill patients with acute kidney injury. Kidney Int 2009;76:422-7. Koeze J, Keus F, Dieperink W, van der Horst IC, Zijlstra JG, van Meurs M, et al. Incidence, timing and outcome of AKI in critically ill patients varies with the definition used and the addition of urine output criteria. BMC Nephrol 2017;18:70. Chawla LS, Bellomo R, Bihorac A, Goldstein SL, Siew ED, Bagshaw SM, et al. Acute kidney disease and renal recovery: Consensus report of the acute disease quality initiative (ADQI) 16 workgroup. Nat Rev Nephrol 2017;13:241-57.